"I liked meeting the Sutherland brothers and their colleagues, very professional yet humble and genuine people who take a real interest in their clients." "It’s clear you really care about your clients and want to help them reach their goals. I am happy to continue to follow your guidance as I have done the last few years." "Stephen spent almost an hour discussing many aspects of investing and all at no charge. Personal care, guidance and insight of this quality is invaluable to me as an investor." "I found that the telephone call with Stephen gave me tremendous value. I am delighted to be a client of ISACO and would definitely recommend your service to others." "If you are looking for a company with a deep understanding of the stock market, market cycles, the best time to buy and the best time to be in safer investments, ISACO hit the mark." "Most people who write market reports just touch on what most of us already know, and certainly none of it has any really logical thinking, unlike your comments." "I have been a client of ISACO for several years and have been strengthened in confidence, not only by their professional skills but by their total honesty and integrity." "When it comes to investment, it is hard to tell who is good – but I have been very impressed with Stephen, his record and the logic of his approach." "Your ISA Guide - Very simple and concise message. Plain English with no fluff." "What a pleasure to have great service like yours." "The Daily Market Updates and the Big Picture are both superb. Stephen is a genius. I am so excited by this opportunity and can't wait to get started. Stephen and Paul are an inspiration to me and I know I have made the right decision in joining ISACO." "Thank you for taking the time to talk to me on Friday evening. I am still taken aback by the value of the information received. It was definitely much more than I was expecting. Truly excellent, 11/10!" "My brother and I are both full time nhs consultants specialising in anaesthesia, and have for some time sought a vehicle - other than the slavery of private practice - to generate wealth without compromising our primary profession. Shadowing is the solution! The technique is a strategy identical to how we train our own junior colleagues, minimising individual risk and maximising return on time invested." "I have been a client for some time and I’m impressed." "Having taken the decision to consolidate all my legacy pension's into a SIPP, I remained frustrated that my IFA sat firmly on the fence in terms of recommending funds despite being aware of my risk profile. Discovering ISACO was a breath of fresh air – an organisation that believed so much in their own expertise that they actually put their money where their mouth is. In many ways it looked too good to be true. However after long discussions with Paul & Stephen two straight talking astute & knowledgeable northern guys, I took the plunge and invested 100% of my significant SIPP in a way that modelled ISACO's investment profile. And thank goodness I did 6 months later the fund is up 8%, my financial investment stress levels are down 100% and I have made 2 new friends who I can trust to use their considerable expertise to manage their investments and as my SIPP is aligned I benefit. This service is unconventional and the decision to sign up was not easy, but 'fortune follows the brave ' and hopefully my faith in following simple logic .that an expert with skin in the game will deliver outstanding performance over the long-term will continue to be borne out." "From the outset, both the documentation and personal discussions have been very helpful and supportive. The style and clarity of explanation have been excellent in underpinning confidence in investing and developing (in only a few weeks) a vastly improved understanding of market timing and active investment strategies. Many thanks." "The Sutherland brothers have had a massive impact in my life. I’m an NHS personal assistant on a modest salary however due to Stephen and Paul’s influence, I am proud to say I now have quite a large sum invested in ISAs. I’ve known Paul and Stephen since 2006 and to anyone who is thinking of joining ISACO, I would say, don’t hesitate. Paul and Stephen are the most genuine, friendly people I have ever met, who are always happy to share their wealth of knowledge, and have supported, advised and guided me in the directions I have chosen to go." "I was so impressed with Stephen’s expertise that I decided to endorse him on LinkedIn. I have seen, although it’s early days, a marvellous performance in my small investment shadowing him and his team." "My wife and I joined the ISACO shadow investment service in May 2009 after reading Stephen’s book Liquid Millionaire. This immediately gave access to the Daily Market Update, which is his daily interpretation of the previous day’s market results in terms of price and volume action. We also gained access to his recommended ISA investment funds; funds he personally owns. Some 17 months later in December 2010 I checked the progress of the specific three funds currently in Stephen’s portfolio, which we are shadowing, to find that the increase in value of my holdings was 67%, and this was without any monthly fund top-up. My wife’s ISA growth was noticeably higher, as she is making monthly additions; a graphic illustration of the value of doing this. This year there has been a pullback due to the general retracement in the markets, but the Daily Market Update keeps on coming through, and I know that if Stephen ever believes it is time to come out of the market into cash, I will be one of the first people to know through the update. We have never before found an investment service which gives us the confidence and results available from ISACO." "I’ve been using ISACO shadow investment service since 2008 and I’m happy with the all the investment decisions that have been made by Stephen Sutherland and his team. The time friendly service is ideal for me, due to my job. The investments funds since the start of the bull market have produced 56.4% (2009) and 27.2% (2010). Overall a 9 out 10 for happiness levels." "I’ve made a gain of 8.2% in just 8 months." "I have been with ISACO for five months now, as per their advice I have resisted the temptation to continually review the weekly performance of my investments as this is obviously a long-term plan for retirement. I am delighted to share with you that by following the daily advice my portfolio has grown by 11% during the five month period. Thank you for taking me on the exciting journey so far, great service and support!" "I first came across ISACO in 2009 when I was looking for a financial advisor, but felt their service did not match what I needed at the time. Fast forward to late 2011 when I was reviewing my portfolio and felt it was time to have it managed by a provider who took my concerns about particular funds into consideration when investing on my behalf. Paul, ISACO’s Managing Director personally took care of me and made time to explain the service on offer, providing me with mountains of information I requested, as well as answering my numerous questions. ISACO seemed just what I was looking for. In June 2012 I finally moved part of my portfolio to the ISACO service and since then the value of my ISAs have increased by 11% and my pensions by 7%. Pretty good results in 6 months! As my confidence in the premium service grow I have, and will continue to increase the proportion of my holdings that mirror ISACO. Thank you Paul for all your help and support." "I just wanted you to know how good I think your ‘The 7 Biggest Mistakes…’ report is. These are the same lessons that I have learnt in 44-45 years of investing. I agree with every single one, except that as you know, I personally prefer to invest in individual companies rather than funds. I would certainly endorse your methodologies and your investment philosophy." "I am more than ever convinced that I made one of the best decisions of my life when I signed on the dotted line with ISACO"
"ISACO provide an excellent service that is hugely informative, simple to absorb and immensely reassuring to investors, particularly during the current period of economic turbulence. Stephen's understanding of the stock market is outstanding, as is his commitment to provide the best possible service, support, and value to his clients. Ultimately it's the performance of ISACOs portfolio recommendations that speaks loudest; they are market beaters who are always 'watching your six' on both the up and downsides." "It’s now been four years since I became a client of yours, I fully believe in your concept and have made good returns, it’s a great system"
"I became a client of Stephen’s after reading his first book Liquid Millionaire in 2010. I read a lot of the financial press and get confused by most of it. Stephen’s very clear and straightforward approach seemed to me to have real integrity. I have not regretted my decision. I just wish I had found Stephen, and his brother Paul, ten years earlier!!" "As I am no expert in picking the right fund AND a fund with low or no fees, or the actual timing to switch funds, I decided to simply use the premium shadow service of ISACO, who have achieved attractive annual growth (independently confirmed). It really is a no brainer – the money I unknowingly spent on fees with my company pension more than pays for this service – my SIPP pension pot as well my stocks and shares ISAs have gained considerably since joining the service. If you are worried about paperwork and form filling, don’t be – this is all taken care of by ISACO. Together with the ‘Daily Market Updates’ and monthly ‘Big Picture’ I receive by email, the simple fund platform that I use to view my investments on my smart phone and the unlimited support from ISACO, I can honestly say I am not worried about my financial future as I feel I am in control. I am more than happy with my experience with ISACO (I consider Stephen and Paul as my friends) and I am happy to personally discuss this with anyone, such is my belief in them. 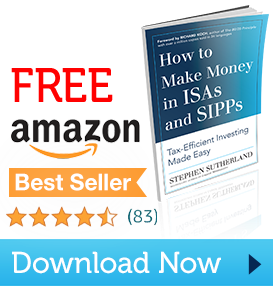 The book (How to Make Money in ISAs and SIPPs) and service is certainly 5 stars."